A great big Texas welcome goes out to ‘ribbit’ in the Austin area. She’s now the newest member of the Texas Preppers Network and looks forward to sharing ideas and information with everyone. Those of you wishing to contact her directly can email ‘ribbit’ at rez@cedarberry.com. The lack of critical resources can create a major problem for you and your family during a crisis. While many people have sufficient food resources, many lack that most vital of resources…water. You’ll need water for hygiene purposes, for cooking and to drink. You will also need a way to filter and purify any water that is used for drinking or cooking. A good water filtration and purification system is pretty easy to obtain and many are lightweight and portable. The problem arises in how to have sufficient water storage for your family in an urban environment. The trick here is to use a little “stealth” in your prepping. In a survival situation, those items which can serve a multitude of purposes will often serve you best. It also helps if they don’t draw unwanted attention and are readily available in a crisis. People often don’t think in terms of alternate uses and this can be utilized to your advantage. Water poses a unique problem in that it is heavy and difficult to store in large quantities for the average urban homesteader. A five gallon jug of water is over forty pounds and can be difficult to carry if you’ve neglected to stay in shape or suffer from a physical impairment that limits your activities. They will also take up a lot of space inside your home. Space you may need for other things. There are a few simple solutions that can be utilized by most anyone to solve these problems. Sometimes you just need to think “outside the box”. 1.) Use a small inflatable pool to store additional water outside. The neighbors won’t give it much thought and if needed can furnish your family with a large amount of water in a crisis. Even a small, rigid “kiddie” pool can hold a lot of water for use in a crisis. 2.) Use small water features to store additional water for a variety of purposes during a crisis. 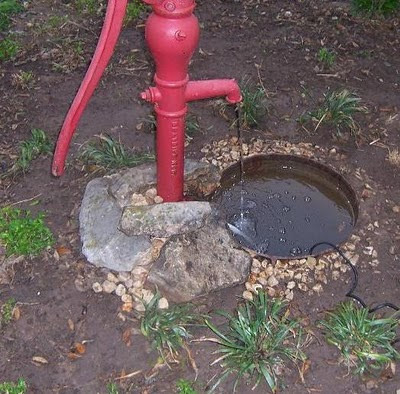 A couple of small water fountains on the patio or in your yard can be utilized as a resource to store additional water supplies without being obvious to your neighbors. A small artificial pond could be used to store an even greater quantity of water. 3.) Utilize a rain catchment system to harvest additional water. Even a small 30 gallon garbage container will catch a large amount of rainwater and can be easily hidden from prying eyes by a little “stealth” landscaping. These are just a few of the ways to increase your water storage in an urban environment. Chances are you can think of many other ways to accomplish your goal of additional water storage for use in a crisis. While there are certain costs involved with being prepared, it doesn’t have to wreck your budget. Using some plain old “common sense” will help you become better prepared without breaking the bank. It will make things a lot easier for you while giving you the security and peace of mind that comes with being prepared. One of the first things you should realize is that the average person cannot realistically prepare for every contingency that may occur. Just when you think you’ve got all the bases covered, something will happen that will prove you wrong. This is usually the way life is in the real world. Avoid some of the simple mistakes that happen quite often when people are trying to become better prepared and more self-reliant. Avoid drastically altering your lifestyle if you aren’t willing to make some serious sacrifices. Being able to live “off-grid” is a wonderful thing but it also has its disadvantages and may require some serious adjustments to your lifestyle. Having ten cases of MRE’s in storage is a good thing. But if you’ve never eaten one, you’d better eat a few first to find out if this type of food storage will work for you. Similarly, stocking up on survival seeds won’t do you very much good if you’ve never planted a garden to find out just how much work planting and being able to maintain a garden involves. That old hunting rifle or that .22 rifle or shotgun you use for varmint hunting or plinking will probably serve most of your basic needs when it comes to firearms. If your preparedness efforts don’t fit into the normal routine of your daily life, you may wind up with a lot of “stuff” that you may not need or will never use. This can be extremely costly and unnecessary in most cases. Your preparedness efforts will be a lot more effective if they are slowly integrated into your present lifestyle and done so in a manner that allows these efforts to become a part of your regular routine. You’ll eventually become better prepared without destroying the “normal” part of your life if just use a little “common sense”. Things continue to fall apart at the border. 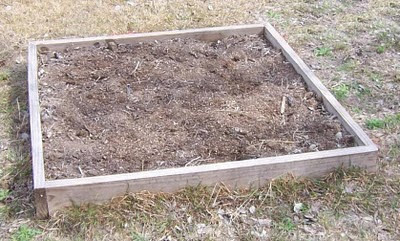 Raised bed gardening is an option for those persons having poor soil conditions or limited space. You may even have both of these problems. 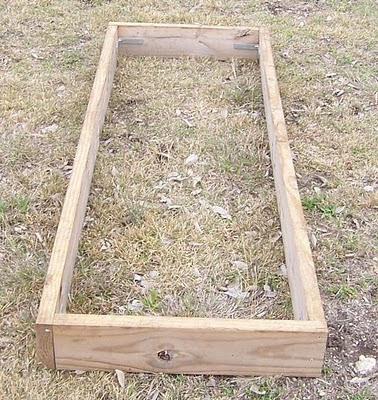 A simple raised bed for your garden may be the answer to your problems. The size of your raised bed is important if you don't want additional problems. Two simple sizes can work to your advantage when it comes to working your raised bed garden. The above picture shows a simple 4 foot by 4 foot raised bed frame. This was made from two 2x6x8 foot boards, each of which was cut in half and screwed together. When factoring in the average reach of a person (about two feet), this keeps everything within easy reach and avoids unnecessary physical strain. 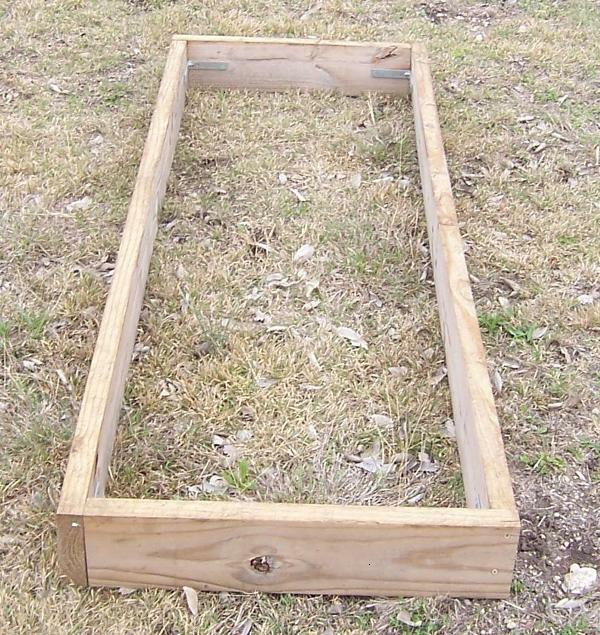 You can also use a rectangular shaped raised bed to make a raised bed easier to work. Two 8 foot 2x6 boards are all it takes. Cutting two feet off each board and attaching them together gives you a 2x6 foot raised bed for your garden. Depending upon what you're planting you can use 2x8's, 2x10's, or even 2x12's to make a raised bed that will provide deeper soil levels for your plants. It also helps to add some additional bracing inside the frame for your raised bed. 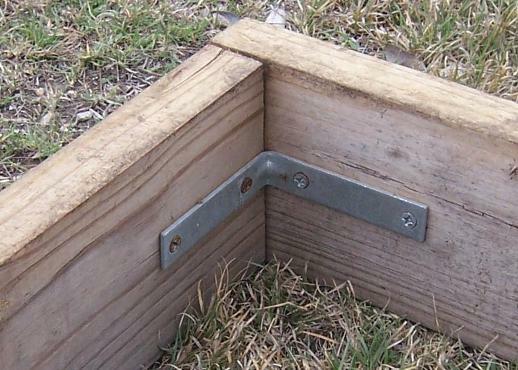 A simple 4" corner brace on each of the corners of your raised bed will add additional stability. Using basic sizes will also make them easier to move if necessary and allow you to place them according to available space. 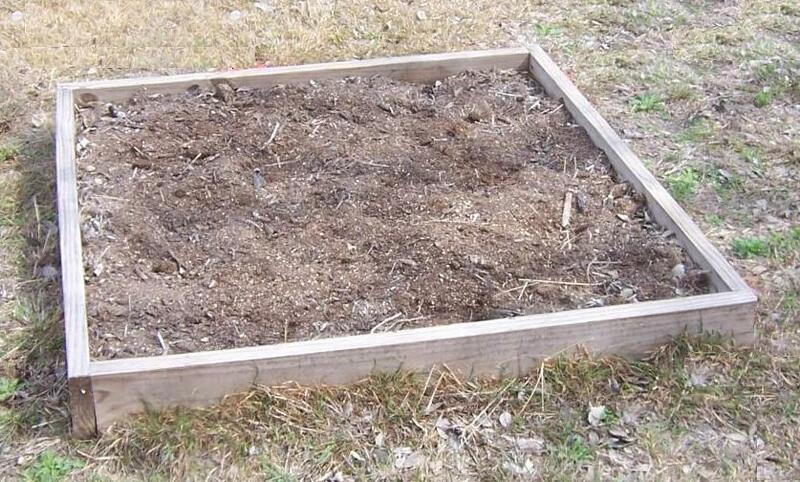 Old newspaper or a cardboard box can be used as weed paper for your raised bed. It doesn't require a lot of material to build a decent raised bed for gardening but you'd be wise to keep basic sizes in mind that won't cause undue physical stress by putting things beyond your normal reach. Gardening can be a very rewarding effort if done right.